Both of these robots are affordable, entry-level, but do have wifi-connectivity. What sets the Roomba 675 vs. 690 apart? Continue below to find out. Price: The Roomba 690 is slightly more expensive under normal pricing conditions. Virtual Walls: The Roomba 690 comes with a dual-mode virtual wall barrier, while the Roomba 675 does not. Aesthetics: The Roomba 690 is a light silver color with black accents and the Roomba 675 is a dark gray color with black accents. The design of the Roomba 675 and Roomba 690 is basically identical, with only slight differences in the color. The Roomba 675 has an all black aesthetic, while the Roomba 690 uses a combination of black and light gray. The buttons are the same, including a central “CLEAN” button, a spot clean button, and a dock return button. Additional settings and features can be accessed through the iRobot app on your smartphone. In addition to the buttons on the top surface of the Roomba, both the 675 and 690 have the same release for the dust bin and filter as previous models. Across the board of robot vacuums, this is a pretty average size, and does a nice job of maneuvering most areas. For more size comparisons and reviews, see our full list of robot vacuum reviews. Included accessories is one area where there is a notable distinction between the Roomba 675 and the Roomba 690. The virtual barrier wall is used to block off certain areas of a floor plan that you don’t want Roomba to access. This can be a useful tool when cleaning larger floor plans or complicated layouts with numerous obstacles. VIRTUAL BARRIER | The dual-mode virtual barrier is capable of blocking off a linear path up to 10′ long or a radial area up to 4′ in circumference. This helps to protect a variety of areas including hallways, open concept wide spans, as well as sensitive areas around pet food areas or other furniture. So we’ve looking at the outside—now let’s dive into the inside and analyze cleaning performance. Both the Roomba 675 and 690 model uses a bristle style brushroll (compared to the rubberized brushroll in advanced models, like the Roomba 980 and i7+). Both the Roomba 675 and Roomba 690 use the AeroVac filtration system. This system is slightly less efficient than its successor, the AeroForce system. But that’s not to say that the AeroVac is bad by any measure. The AeroVac filter is still a HEPA filter. The Roomba 675 and Roomba 690 come with the same 1,800 mAh battery and use the same motor (at least from what we can tell during our research). And the run time is? Both Roombas have the same 90 minute run time. All of these details listed above help to determine the overall cleaning performance of each model. Due to the striking similarities between the Roomba 675 and Roomba 690, we can assume that the cleaning performance would also be virtually the same. Below, we have pulled all of our cleaning testing data for the Roomba 690. A full cleaning performance test here at Modern Cycle consists of 12 different tests; that’s four different debris types (cereal, kitty litter, rice, and sugar) and on three difference flooring types (hardwood floor, low pile carpet, and high pile carpet). Cleaning performance on hardwood floor was excellent. The Roomba 690 was able to remove 95%+ of all debris types. Overall cleaning performance on low pile carpet was great as well, with 3 of the 4 tests scoring 98%+. Cleaning performance on sugar wasn’t great, scoring a 72%. However, this is still a fairly good score for most robot vacuums. The ultra fine sugar particles are difficult for robovacs to remove. In order for a robot to remove sugar particles in carpets you have to step up to a more expensive pricing tier. Lastly, cleaning performance on high pile carpet mirrored what we saw with low pile carpet cleaning tests. 99%+ of debris was removed on 3 of our 4 cleaning tests. The one problem area again was the sugar tests, which only scored a 66%. Again, this is still a pretty good score for a robot vacuum. Most robot vacuums really struggle with sugar on carpet. The usability of the 675 and the 690 is another area that is hardly distinguishable. Both robots have identical physical buttons on the face of the robot as well as wireless connectivity. 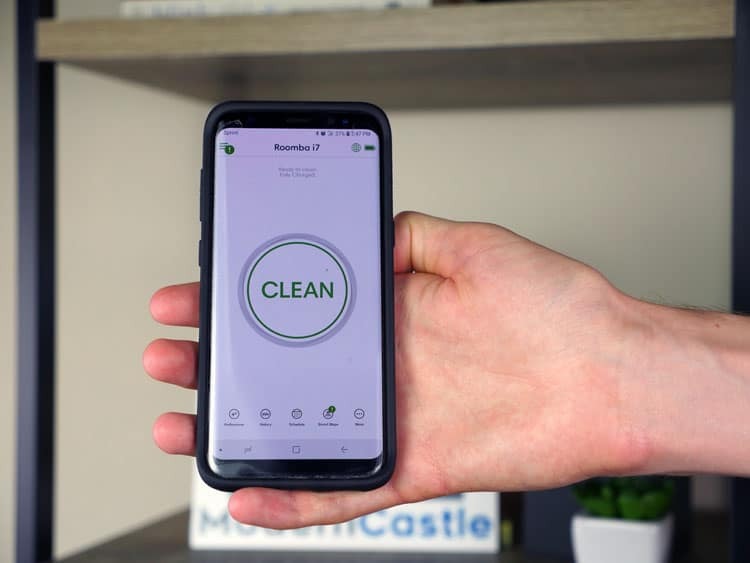 Starting a cleaning is as easy pressing the “CLEAN” button on the vacuum itself, scheduling a cleaning on the app using your smartphone, or even simply saying “Roomba, clean” (provided you have Alexa or Google voice setup). The Roomba 675 and 690 are compatible with Amazon Alexa and Google Assistant for hands-free voice control (when paired with a voice control device like the Amazon Echo or Google Home. 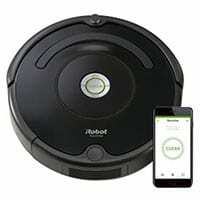 Both the Roomba 675 and the Roomba 690 are able to connect fully to the iRobot Home app for full wireless controls. Using the app, you can start or stop a current cleaning, view cleaning history, or schedule a cleaning in the future. Setup to the app is also easy. Below are some of the setting and control views on the iRobot app. Since both the Roomba 675 and Roomba 690 are identical in size, maneuverability from that perspective is basically the same. The other factor that comes into play when considering maneuverability, is navigation technology. Both the Roomba 675 and the Roomba 690 operate with iAdapt 1.0 technology. Roombas in the 800 and 900 Series generally have the iAdapt 2.0 navigation technology while the newest Roomba i7 and Roomba i7+ employ the most advanced navigation, iAdapt 3.0. What do you get with advanced navigation? With advancements in navigation comes the ability the see obstacles before they hit them, advanced memory mapping, Imprint Smart Mapping, and the ability to remember digital maps of different floor plans. For more information on iAdapt 3.0 see our Roomba i7+ review. The Roomba 675 and 690 is a more basic approach, basically “Bump and Continue”. Both models have edge sensors on the underside of the robot to prevent the robot from driving off of drop zones, like stairs or lofted space. But outside of these sensors, the cleaning pattern is sporadic, zig-zag, and a bit unpredictable. Despite this random approach, the cleaning performance above shows these models with base level navigation still clean up an astounding amount of debris from the cleaning tests. Both the Roomba 675 and Roomba 690 are excellent values. Depending on your needs, one model could be a better value than the other, seeing as they have slight differences. The Roomba 690 is slightly more expensive, but includes the virtual barrier wall, an accessory that is not included with the Roomba 675 model. That said, for smaller floor plans or simpler layouts, you may find that you don’t need a virtual barrier anyway. In these cases, it could be a better value to forgo the additional costs and enjoy the savings, without the virtual barrier. Keep in mind that if your environment changes, the Roomba 675 is compatible with dual mode virtual barrier walls if you ever decide to add them. No pressure to feel like you have to decide immediately. Below you’ll find a complete comparison of important specifications on the Roomba 675 vs. Roomba 690. Weight 7.8 lbs. 7.8 lbs. Which Roomba is Right for You? 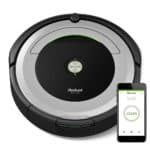 If you’re deciding between the Roomba 675 and Roomba 690, as mentioned above, the first thing you need to do is decide what is most important in a robot vacuum. That said, if blocking off sensitive areas is important to you, the Roomba 690 is your best bet, as it already comes with a virtual barrier wall. If you don’t care about the virtual wall you can save yourself a few bucks by going with the Roomba 675. For more information on the Roomba 675 robot vacuum, check it out at Amazon.com. For more information on the Roomba 690 robot vacuum, check it out at Amazon.com. March 31, 2019 – Overhauled the layout and design of the page. November 22, 2018 – Fixed a couple of small formatting issues. October 10, 2018 – Updated a re-designed comparison table and a few other small formatting changes. September 19, 2018 – Initial version of the comparison was published.